Why do men become more attractive as they age? Men Objectifying Women: Is It Really So? Mother’s Day, Father’s Day & The Child! “Some time ago I received a call from a colleague. He was about to give a student a zero for his answer to a physics question, while the student claimed a perfect score. The instructor and the student agreed to an impartial arbiter, and I was selected. At the end of five minutes, he hadn’t written anything. I asked if he wished to give up, but he said he had many answers to this problem; he was just thinking of the best one. I excused myself for interrupting him and asked him to please go on. In the next minute, he dashed off his answer, which read: “Take the barometer to the top of the building and lean over the edge of the roof. Drop the barometer, timing its fall with a stopwatch. At this point, I asked my colleague if he would give up. He conceded, and gave the student almost full credit. While leaving my colleague’s office, I recalled that the student had said that he had other answers to the problem, so I asked him what they were. “Of course. If you want a more sophisticated method, you can tie the barometer to the end of a string, swing it as a pendulum, and determine the value of g [gravity] at the street level and at the top of the building. “On this same tack, you could take the barometer to the top of the building, attach a long rope to it, lower it to just above the street, and then swing it as a pendulum. You could then calculate the height of the building by the period of the precession”. The name of the student was Neils Bohr – The Nobel Prize Winner in Physics 1922. Below is my first hand experience with PayTM. I thought of putting it up in a blog post to ensure it reaches out to Indians and common men aren’t fooled by organisations like the PayTM to decietfully get their biometrics. It all started when PayTM restricted fund transfers from my account abruptly from April 2018 without any prior intimation to me and forced me to KYC. This was inspite of the fact that no services can be barred if Aadhar isn’t linked. I updated my KYC details online and they sent an employee to my residence for what I assumed to be a Process of inspection of my original documents and collection of necessary photocopies. However, they sent the employee with a fingerprint capturing device and wanted me to provide my thumb and fingerprint information to them. When I objected that I can’t be forced into providing my personal biometrics when it isn’t mandated by government or our Supreme Court, like a typical sales guy, the PayTM’s employee started selling their position that the data will remain safe & secured, many other customers have already provided their biometrics and why I should, like them, also opt for it. After some discussions when his persuasions did not work and he was convinced that I won’t be falling for his or PayTM’s tricks, he called his manager and they promised that they can get a form filled & take some photocopies to complete the formalities of KYC. Surprised that I wasn’t informed or provided this option earlier, I pointed this out to the guy. Nevertheless, I agreed. The guy promised to revisit my place next day again for the formalities. It has been 4 days now and he hasn’t arrived, which is still, to an extent, fine. I am hopeful that PayTM will complete this task, albiet slowly. PayTM’s forceful bar on it’s customers (I am sure there are many customers like me) and not allow them to pay money from their PayTM wallets or transfer funds is highly inconveniencing. It’s rendering common people like me powerless as if they didn’t have any money in their wallets. Smartly, PayTM is still allowing credits or transfer of funds to the PayTM account but disallowing any debits. It’s as if they want the money to trickle in but not to leak out of their ecosystem. This is a very mean way by PayTM to make money. PayTM’s assumption that people will opt for (providing) biometrics at their behest without showing the terms and conditions to it’s customers or undertaking an agreement is unethical, unprofessional and decietful. This raises questions on PayTM’s integrity. Not providing it’s customers the option or the mandatory information that there is an alternate way of completing KYC formalities (document based KYC) is like forcing it’s customers to supply PayTM with critical, sensitive information like a customer’s personal biometric details. This is a treacherous way to scheme their customers into a PayTM trap. It’s highly deplorable. PayTM’s lack of preparedness to make it’s employees carry all relavant forms or docs during verification for customers not willing to divulge personal biometrics and those willing to opt for document based KYC is careless and very unprofessional on PayTM’s part. I only wish more and more people become aware of PayTM’s wrong-doings for their “forced” KYC process involving biometrics. I personally wish that PayTM’s customers DO NOT opt for biometrics with PayTM and that no one is fooled by PayTM. Questions are already being raised on why PayTM is asking it’s customers to provide Aadhar details as proof. I also hope we, Indians, are aware of how dangerous it can be for PayTM or any other forms including the governement, if their personal biometrics fall in wrong hands. We need to ensure we aren’t victimised by the loopholes within our flawed policies & system. Sadly, there are many! This video provides insights to how cancer cells can be destroyed naturally and malignant tumours can be prevented. Its a part of a social experiment on body’s reaction to destroy cancer cells, more specifically Prostate cancer cells. Please watch the video to see how your immunity against cancerous cells can be boosted naturally without altering your daily schedule by a lot. Firstly warm wishes to you in advance of upcoming Men’s Day, which falls on 19th November. I am sure you all are doing some fantastic work in your respective areas and I appreciate you for that. I am sending this email (also an open letter shared outside) with 3 simple reasons to light up our Mumbai’s iconic World Heritage structure and a historic building we are all so proud of – the Chatrapati Shivaji Maharaj Terminus (CSMT) – in Blue lights on Men’s Day eve and Men’s Day i.e. on 18th and 19th November 2017. Men have always been silent contributors for the society – be it a young man supporting his family or a senior citizen indulging in social service. Their contributions deserve to be respected and acknowledged. They need to be appreciated and encouraged. “CSMT in Blue” will be step towards achieving this. Men’s Health: There is a huge “vaccum” in India when it comes to men’s health. There is a lot of space for research or simply generating awareness related to health disorders men suffer from. “CSMT in Blue” can spread light on such health concerns of men and these ought to be highlighted. Issues related to men is a very dark area. The universal belief that men dont need help or they can be on their own leads to almost complete ignorance towards grievances of men’s issues. There’s a huge lack of empathy towards men and their problems. However men are human too and can be as vulnerable as women when they find themselves wronged by same or other gender. In fact suicides in men are double than that of women which confirms that are under tremendous stress or burden and there grievances need to be addressed. “CSMT in Blue” can be symbolic to light up these dark areas concerning men. Elaborating on Men’s Health: Men’s Day falls in the month of November, which is also called as Movember. During this month men are encouraged to “grow their mo” i.e. moustaches & beards. The idea is to save some money by not shaving for a month and donate this saved money for cancer research which men suffer from. Every 7th man can potentially suffer from the life-threatening Prostate Cancer sometime in their life. Not much is known or researched about Testicular Cancer. Like breasts in women, testicles are external organs and careful amputation of testicles is done to save lives. Early detection of Testicular cancer can help prevent loss of lives. Periodic physical examination by self is the only way to early detect lump formation or Testicular Cancer. Lung and Throat Cancer are also very prevalent in men and campaigns to give up smoking (also used by men as stress-buster) can save lot of lives. “CSMT in Blue” can be a message to all men to be self aware of their health. On other lines, if CSMT can be lit up in pink on Women’s Day, in Indian tricolour during India’s Independence Day, in French tricolour after terrorist attacks in France and otherwise in different shades normally during the course of a year, why shouldn’t it be lit blue on Men’s Day? Mumbai is probably the most advanced city in India and we do support equal rights amongst human beings without any discrimination, don’t we? We already had an instance of CSMT getting lit up in blue lights on Autism Day. Having done it in the past and having all the resources to light it up in blue, if we have the correct intent, we can light-up “CSMT in Blue” again! Thanks in advance and in anticipation of this wonderful gesture by you for Mumbai, Maharashtra & India. A proud Indian common man. 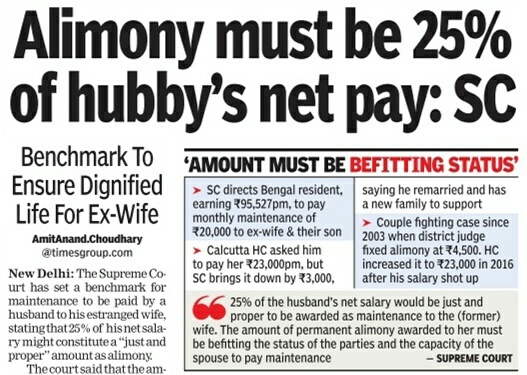 Currently a supreme court judgement on alimony is making the news headlines like “Alimony must be 25% of husband’s net pay”. While most of you may not have the time to deep dive into why such an order was passed, I have made an attempt to understand that. I have gone ahead and read the actual supreme court judgement and I thought there were many mistakes on husband’s part which lead to this judgement which ought not be repeated by others. I will spread light on these later in this post. The Husband was acquitted of charges under IPC 498a & 406. He had earlier applied for Restitution of Conjugal Rights (or RCR) under Hindu Marriage Act in an effort to call his wife back for co-habitation which he subsequently won and still wife refused to co-habit with him, not following courts orders. He also made alternate arrangements for co-habitation with wife separating the family from his parents. Still the wife refused to come and to prevent this she filed for judicial separation. Husband objected as written reply but couldn’t attend the court case as he was allegedly man-handled in the court. The judicial separation was thus passed ex-patry in favor of wife. Husband then applied for divorce which was granted. His wife had applied for maintenance under HMA when husband had​ filled RCR, she re-applied it again under change of circumstances a few years later when husband filed divorce stating that husband’s salary increased, thus increasing the amount of maintenance. Maintenance was provided to the wife on both occasions based on the quantum of husband’s salary during time of passing the order. After the maintenance was passed, she applied for review to the high court who revised the maintenance as husband’s salary further increased. Thus it was increased further at the high court. Supreme Court agreed to the view high court had held. The only reason for reduction in maintenance passed by Supreme Court is the presence of a second wife of the husband and a child born out of the second wedlock. Supreme Court ignored the fact that the wife was skilled, was earning a decent amount which quantified to nearly 1/3rd of that of the husband and the child born out if the first marriage was now (at the time of passing the judgement) an adult. Do not apply for RCR as it has always been proven useless time and again. Indian judicial system seemingly doesn’t have any mechanism to enforce RCR judgement (that seeks to save the marriage) won by the husband against the wishes of the wife. Contrarily applying for RCR only attracts maintenance cases under sections HMA 24 and 25. Applying for divorce is also counter-productive for the husband. Although the husband may be granted a divorce on one of the grounds but he may end up satisfying his wife’s greed to get more money/property. Never skip your court dates, however difficult it may be. If you are threatened or man-handled or beaten by some goons while you are attending the court dates in your wife’s territory, file a complaint at the local police station and pursue the matter separately without any fear. A police complaint should be a deterrent to the goons and in-laws in their efforts to traumatise you even more. Contrarily, not attending the court dates not only gives an impression that you aren’t interested in the matter and to get justice, but you also gives entire control of the court proceedings to your advocate and end up losing your grip on the case. You are then at the mercy of your free-willed advocate, lying in-law’s & the misandrous judicial setup. The only respite you have is temporary by distracting yourself from this matter. Second Marriage is not a solution to get rid of the issues faced due to first marriage. Last and not the least, do not marry! As they say, prevention is better than cure! Be an MGTOW. (If you don’t know the meaning of this term, google it now! Free your arteries: The high potassium content will not only help your heart but also curb atherosclerosis. This vascular disease is due to calcium deposited on the vessel walls. This not only narrows the arteries, but also carries the risk in the form of potential blockages. This increases the risk of strokes, heart attacks and other diseases enormously. Eating three dates each day will make a big difference and help keep your vessels clear. Support for your liver: Studies have shown that dates can also help contain liver cirrhosis. This painful condition occurs when the liver can not properly deal with toxins and produces too much collagen. Dates support your liver to overcome the daily requirements. For a healthy heart: Dates are fantastic for your heart. Because the fruit contains a lot of potassium, they are perfectly suited to counteract cardiovascular diseases. At the same time, they can reduce LDL-cholesterol – which is a risk factor for stroke and heart attacks. Eagle eyes: There is a lot of vitamin A in dates. This vitamin helps your cornea regenerate and protects the eyes. They also contain lutein and zeaxanthin, which are both nutrients that allow your eyes to better filter out harmful UV-rays. This means that your eyes remain “fresh” longer and better maintain their capacity. More energy: Together with a few nuts or almonds, dates are the ideal afternoon snack. The sugar content in dates gives you an energy boost that lasts longer through the fat from the nuts and makes us feel full. Simultaneously, brain activity is stimulated, so you get a clearer head from the vitamins. Of course, they are a great sports nutrition. Better digestion: Many people already know, but dates aide with digestion. They help against constipation, stomach aches and many other complaints. Through their “cleansing” effect, they are fantastic as a precaution against intestinal cancer. All these features can be explained by the fiber and amino acid content. They help to optimize your digestion and help your body better absorb nutrients. Dates as pain relief: Hard to believe but true: the magnesium in dates helps to reduce pain and swelling. It also has antibacterial properties and reduces infections in the body. In any case, they are a brilliant supplement to medicinal methods. It’s incredible just how much dates can help with. A great reason to enjoy them more often as a snack.